How good can a manual pencil sharpener be? I couldn't help wondering what in the world all the fuss was about. 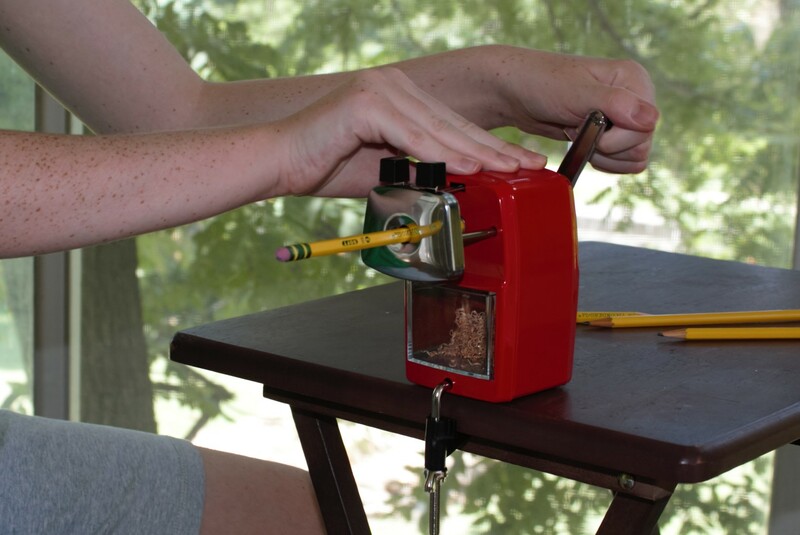 How could a pencil sharpener be that much better than others on the market, that I would see it recommended over and over among homeschoolers? But I figured there must be something to it, especially after I finally became yet another devotee of those Ticonderoga pencils you hear so many homeschool moms rave about. Yeah, I buy mine by the 96 pack now. 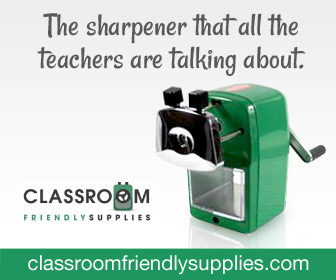 But that pencil sharpener, the one by Classroom Friendly Supplies, with the funny looking black pincers that stick out on the front: would it live up to all the hype? 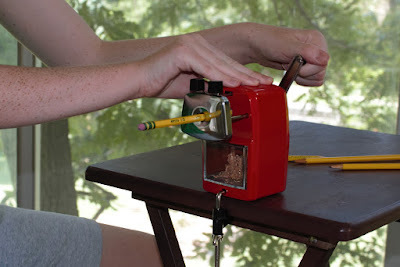 As a homeschool blogger, I decided to take advantage of the review program that Classroom Friendly Supplies offers, and try out their famous pencil sharpener for myself. I chose the red one, because I love bright red things. They make me happy. I figured even if the sharpener turned out to be pretty ordinary, it would still look cool. It took next to no time for the sharpener to arrive in my mailbox. I was anxious to try it out. It took about half a minute to figure out how the black pincers worked. Basically, you pull the metal stage out, away from the sharpener until it clicks, squeeze the black pincers and fully insert your pencil. When you let go of the pincers, your pencil is held securely in place. There's no need to hold it steady. The sharpener holds it in the perfect position for you. Next, you crank the handle. If you turn it the wrong direction, nothing happens. If you turn it the right direction, the pencil starts moving into the sharpener as the blades quickly and easily whittle a perfectly sharpened end in just a few rotations. I have a daughter with very poor muscle tone. She was a preemie, and she never really developed much arm and hand strength, even with physical and occupational therapy. 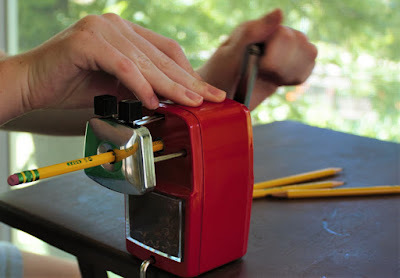 She has an extremely hard time even opening a can of pop on her own, so other manual pencil sharpeners are virtually impossible for her to use. The Classroom Friendly Supplies sharpener was one tool she was able to use with ease. Three cranks of the handle and her pencil was perfectly sharp. 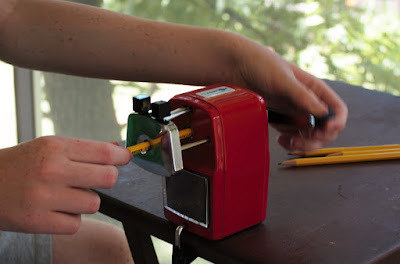 It took her less time and effort to use this sharpener than the office grade electric one we normally use. And the pencil's tip came out smoother and neater than with the electric sharpener, too. I'll admit it, I was a skeptic. I couldn't see how any sharpener could be that much better than others on the market, but I was wrong. If for no other reason than that it works so well for my daughter who can't use other manual sharpeners, I love it! I recommend it! I'm genuinely excited to have it in my home. 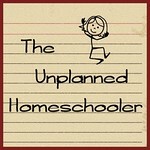 Yes, I got a free one to review for this blog, but if I hadn't, after trying one out, I am certain it would be among the top items on my recommended homeschool shopping list, along with a good three-hole punch, a sturdy printer with economical ink refills, and those irreplacable Ticonderoga pencils. How do you teach your child that character matters? We all want our children to build great character as they grow from little ones into adults. We want them to develop traits like diligence, patience and honesty. But how do you go about instilling these characteristics into your child? Of course, modeling positive character is the best way to help them develop these traits naturally. We are our kids' number one role models, and they often mirror the way we behave. We can teach all day long from books, but it would be hard to undo our own mentoring if we fail to live as the examples we were meant to be. Books and lessons are a good way to reinforce the messages we want our kids to learn, though, and I was recently given the opportunity to review a terrific new resource for positive character building from Stephanie Eidson, the Multi Tasking Mom. 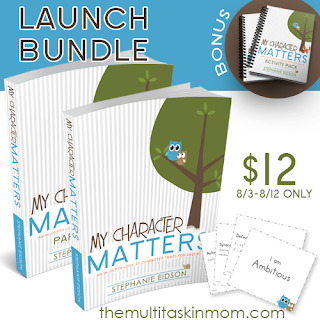 Her new program, My Character Matters, includes a student work book, parent guide, flash cards and an activity guide. You can buy all the pieces separately, or together as a set. They work together to help you and your children explore the meaning of character traits like ambition, responsibility and honor, and discover what those words mean to you and your family, how you've seen those traits displayed in real life and in the media, and how your child can work to improve their character. I am excited to share this resource with you, because it is on sale through August 12, and you can get all of the elements in the kit, a $25 value, for just $12. That's a full 30 weeks of character based lessons for only $12! But even if you miss the launch week sale, this would still be a great value, at less than $1 per lesson, and an excellent addition to your student's curriculum for the year. I hope you'll check it out.